(2) where are the test functions and is the finite element solution of the weak formulation. The first term is the volumetric term and the second term is a surface term describing the advective flux out of the volume. ConservativeAdvection corresponds to the former volumetric term, while the surface term is implemented as a BC in MOOSE (see discussion below regarding OutflowBC and InflowBC). Advective flow is notoriously prone to physically-incorrect overshoots and undershoots, so in many simulations some numerical stabilization is used to reduce or eliminate this spurious behaviour. Full-upwinding Dalen (1979) and Adhikary and Wilkins (2011) is an example of numerical stabilization and this essentially adds numerical diffusion to completely eliminate overshoots and undershoots. 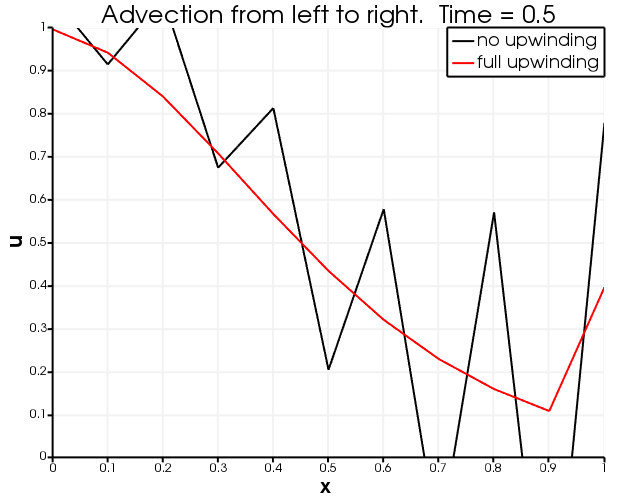 Full-upwinding is available in ConservativeAdvection by setting the upwinding_type appropriately. 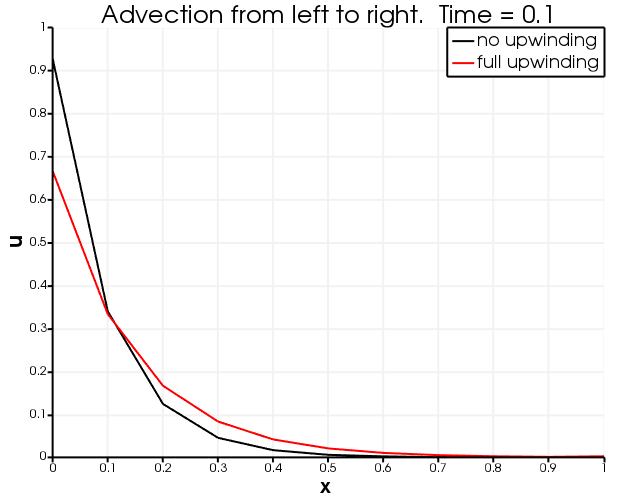 In DE systems describing more than just advection (e.g., in diffusion-advection problems) full upwinding may be used on the advection alone. In practise, it is reasonably common that these more complicated cases benefit from numerical stabilization on their other terms too, in which case full upwinding could also be used, but this is not mandatory and is not implemented in the ConservativeAdvection Kernel. Full upwinding adds more numerical diffusion than most other numerical stabilization techniques such as SUPG and TVD. Another problem is that steady-state can be hard to achieve in nonlinear problems where the velocity is not fixed and changes every nonlinear iteration (this does not occur for ConservativeAdvection). On the other hand, full upwinding is computationally cheap. The velocity is supplied as a three component vector with order , , and . Physically this subtracts "fluid mass" (or whatever represents) from the boundary. For adding the OutflowBC allows "fluid" to flow freely through the boundary. The advective velocity is "blowing fluid" into this boundary, and the OutflowBC is removing it at the correct rate, because the flux through any area is . On the other hand, including an OutflowBC for isn't usually desirable. Adding the OutflowBC in this case fixes at the boundary to its initial condition. This is because the ConservativeAdvection Kernel is taking fluid from the boundary to the interior of the model, but at the same time the OutflowBC is removing : note that , so the OutflowBC is actually adding fluid at the same rate the ConservativeAdvection Kernel is removing it. The physical interpretation is that something external to the model is adding fluid at exactly the rate specified by the initial conditions at that boundary. To make impermeable boundaries, either for or , simply use no BC at that boundary. Then for there is no BC to remove fluid from that boundary so the fluid "piles up" there. For the omission of a BC can be thought of setting in an InflowBC. describe the same physical situation: advection from left to right along a line. A source at the left boundary introduces into the domain at a fixed rate (using an InflowBC). The right boundary is impermeable (no BC), so when arrives there it starts building up at the boundary. It is clear from the figures below that no upwinding leads to unphysical overshoots and undershoots, while full upwinding results in none of that oscillatory behaviour but instead produces more numerical diffusion. # but numerical diffusion is minimized.